Comments: Softcover. Good binding and cover. Clean, unmarked pages. Ships daily. "Aihwa Ong's keen ethnographic perspective brings into sharp relief some of the differences that are essential not only for understanding the contemporary global economic and political systems but also for struggling against them to make a better world. 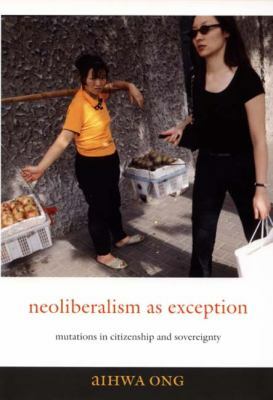 "-Michael Hardt, coauthor ofMultitudeandEmpireOng, Aihwa is the author of 'Neoliberalism as Exception Mutations in Citizenship and Sovereignty', published 2006 under ISBN 9780822337485 and ISBN 0822337487. Loading marketplace prices 7 copies from $8.99 How does the rental process work?